We are here to share with you another free latest method that helps you to unlock frp lock from your device, but this process has too many steps, After the update of latest patch than on the talkback option “Help & Feedback” option is missing. 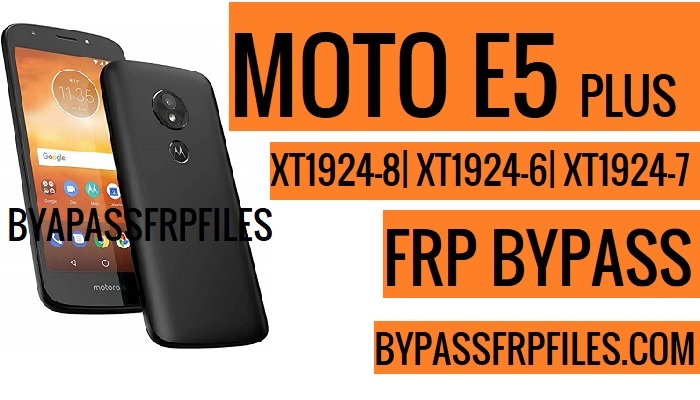 and this is the main problem because we can’t access “Chrome” browser that helps to Bypass Google Account Moto E5 Plus, so in 2019 we share with you the latest method to Remove FRP lock Moto E5 Plus easily. This method we successfully worked on Moto E5+ (XT1924-8| XT1924-6| XT1924-7). -Now there Tap on the “Talkback” settings. -Turn on the “talkback” option. -After that, you will get a talkback tutorial screen. -Draw “L” on your device screen using your fingers. -Then you will get another popup screen “global context menu” screen. -Now double tap on the “text to speech settings” option. -Then double tap on the Setting “gear” icon. -Now press and hold the “Volume UP & Volume Down” button together until you get a popup screen. -Then double tap on the “User Shortcut”. -Again tap on the “Volume UP & Volume Down” button until you get the “Accessibility shortcut” popup screen then turn off talkback option. -Then tap on the “Feedback” option. -Long tap on the typed text to get a “youtube” option. -Tap on the Youtube option, then you will be redirected to youtube application. -Now follow the final process to Bypass Google Account Moto E5 Plus. -Now you will redirected the “Chrome” browser, from the chrome browser welcome screen tap on the “Accept & Continue” then tap “Next”, then tap on the “No thanks” button. -But at first, we need to download only one application that helps you to Bypass Google Account Moto E5 Plus without PC easily. -Just click on the “Done” button to Bypass Google Account Moto E5 Plus Without PC easily. -Now you have successfully Bypass Google Account Moto E5 Plus without PC easily. Thanks for visiting us, if you facing any problem with this Remove FRP lock Moto E5 Plus, the method then you can comment us on below.